Apparently it's not considered family-friendly to drive a spindle out of its bearings after the kids have gone to sleep. Another half inch and it'll be out. Guess that's on tomorrow's agenda. On the plus side, I noticed what felt like the equivalent of a CD-ROM motor with a bad spot when turning the chuck yesterday (and especially so after pounding it just now). Makes me feel less queasy about changing the bearings. So, how much is it going to cost us for a recording, or even just a transcript, of that conversation??? It was quick and to the point. I (much) later removed the spindle, but it's still going to be a bear getting everything apart. The bearing need to be driven in by both the outer and inner rings in both the cylinder shown above and on the spindle so that no warping occurs. I've had projects set aside to and fro for work this past week now that my littlest is in daycare, but not a thing happened. She came home with norovirus and it spread rapidly through the family. Much of this week was spent taking turns getting sick all over the place and then cleaning it up. Everyone's back in shape, but still easing into normalcy. We knew the daycare would introduce illnesses through the baby, but this was a trial by fire. "Total absence" is correct. All of us have been home all week and it took days to even want to pick the phone up beyond moments of absolute necessity. Yesterday, after regaining her appetite in a huge way, the littlest tumbled, changed hands into mine, then promptly threw up the entire day's menu onto my chest. The eldest struggled to take a few bites of dinner and nearly added to the dinner table. So plans for people to return to active duty today fell apart. It's said that this can reappear after 2 weeks, so hopefully we're keeping it from traveling and then back to us. 1. Save up more money as fast as possible. Not much in the bank and that's a bad thing right now given hopeful opportunities. 10. Get a Nexus 5 to experiment with UBports, formerly Ubuntu Touch. Related, I wish the TAILS team would port to ARM CPUs. Those are the most pressing personal projects right now. Back at work, kids and wife at their respective places as well. Good to be back in action. I had very small chunks of time this weekend, but was able to do a couple of interruptible labor-related things as opposed to sit-down-and-think. The other was an unexpected Facebook Marketplace scramble. 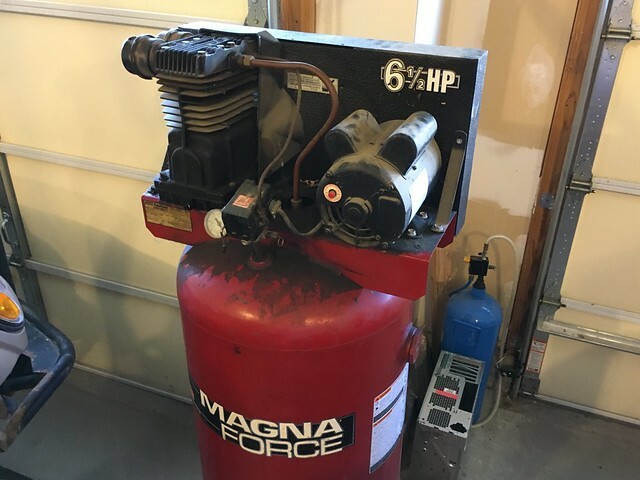 A 60 gallon single-piston/single-stage compressor went up for sale at $200 in a neighboring area. Would I like double-stage with three pistons? Sure, but this is vastly better than nothing in the garage and will finally allow me to put my blast cabinet and tools back to work. Glad this came out of family money as we have an irrigation system which needs yearly blowout. Apparently they had snapped the threaded quick-connect at some point...which pretty much means the unit is temporarily unusable and that it's been open to the elements for some unknown time, possibly the three years since it's last been used. That might be good or bad with the low humidity here and/or moisture that was in there. 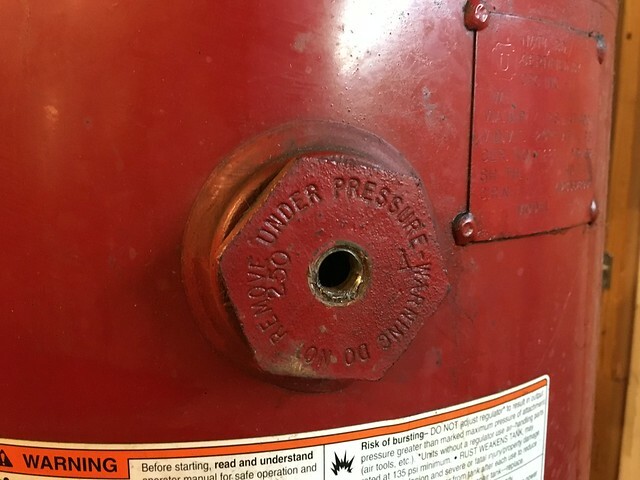 The tank's pretty old and has probably seen a lot of use. The quick-connect remains are cemented in there and the metal is weirdly soft, so it's no wonder it snapped so easily. 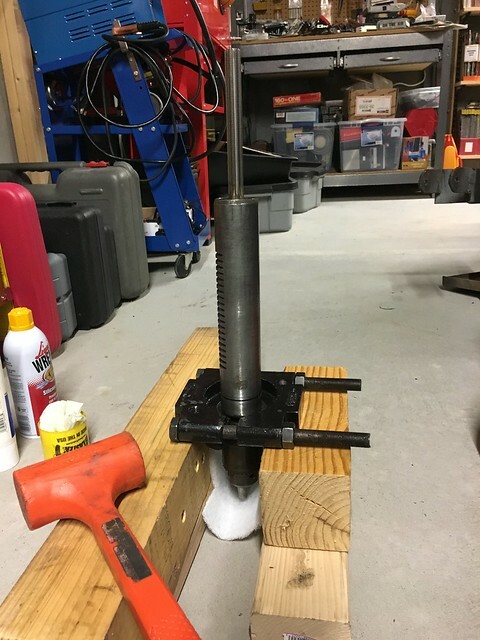 A friend suggested hacksawing down to the threads and imploding it, which is a decent idea, but it'll dump metal residue and chunks into the tank. Would at least be better with a vacuum hose held nearby and the drain unscrewed for airflow. Alternatively, I can just buy a new hex cap, but I only have one wrench that comes close to that diameter and the cap doesn't budge, presumably torqued pretty tightly. I'm broke and am more likely to hacksaw with the hope that air filters will catch anything particulate. Drive it around on the corner of each face. Almost nothing done on my list and plenty more on it. Got sidetracked by a Marshall Stanmore rebuild which involved numerous cheap parts from eBay. And just spent a whopping $6US on an ESP-01 (cheap ESP8266 board), USB programmer, and 4-channel analog multiplexer PCB. If this turns out better than expected--and it does look like fun--I'll start looking at NodeMCU and Wemos. Still hoping Infineon will follow through and send their 3D Hall Sensor dev board. These are genuinely on my radar for the upcoming weeks, especially now that the weather abruptly changed seasons. At work, I'm sorting out some stuff with an old Warp-13 PIC Microchip programmer I bought around 2005 or so. 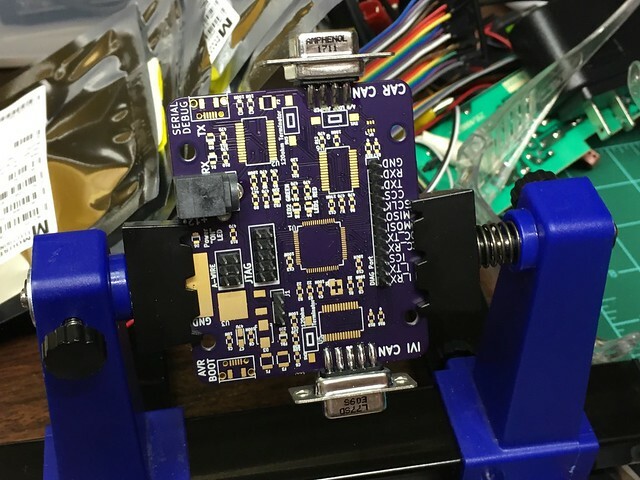 The software mostly runs over USB-to-serial with WINE and there has since been a clock and firmware update that substantially expands the programmable chip list. Meanwhile, my truck is still trucking along. I've decided not to try to integrate Bluetooth audio and phone with the Pi at this time since a few bucks in hardware can handle most use cases. Sound out on the Pi and a touchscreen keypad w/ Ophono over THAT Bluetooth to send my phone a "call" string is far more dependable at this time. As for the compressor, it would have needed to be bolted down to get the right torque on that valve cover. I ended up drilling it out, chased the threads, and used a Harbor Freight gift certificate to buy a ton of supplies. I say "ton" because they literally gave me the gift card not to show up on their doorstep with complaints (I was visiting UCLA at the time, approximately 40 minutes away from the main office). The card contained a nice balance.